Are you in a search for a gaming app that will make your time spent on your mobile worth it? Look no further! 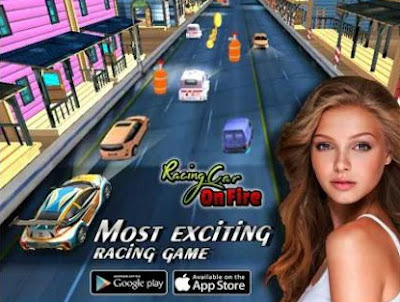 Racing Car On Fire is the game you’ve been looking for - it is one of the most entertaining games on both Android and iOS platforms, designed for both phones and tablets. A perfect way to spend quality time playing is by playing a racing game that will challenge you and addict you to the fullest. The developer team, Appoon Games, made it with marvelous design and one of a kind graphics and of course, with very engaging gameplay. If you’re into racing games, you’ll love Racing Car On Fire. All you have to do is download it, choose a cop car and start chasing criminals around the town. Dodge everyone, drive with your car as fast as you can and reach your final destination. You will be able to choose from over 20 beautiful racing cars and collect many daily gifts. If you want to drive even faster you have to collect fuel on the road and if you want to drive even cooler vehicles, you can transform your car into tank, helicopter and much more. Test your driving skills by playing this combination of speeding, racing, crushing and destroying, turn your racing car on fire and have hours of fun by downloading the game for free from Google Play and from the App Store.